Searching for Waterproofing Contractors in PA. or NJ.? 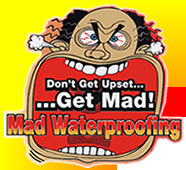 Get Mad Waterproofing, and we'll Make A Difference! Mad Waterproofing is a mid sized Construction Company specializing in Commercial and Residential Basement Waterproofing and Structural Repair. We are Licensed and Insured in PA. and NJ. FHA Approved for Waterproofing and Mold/Mildew Remediation. Our Vision is to be the #1 Basement Waterproofing Contractor Company in the New Jersey & Pennsylvania areas, with a Mission to provide our customers with a quality Basement Waterproofing System at a fair market price.